We’re once again in Dhaka for 1-2 months and then headed to Lahore for a month. All this moving around lately has increased and due to this I decided to get a portable laptop for my wife, Maliha so she can chat and surf while I’m at work during the day. Basically, we didn’t need to have another full-sized laptop to lug around and from this perspective; the Asus EEE series has been a real blessing. ‘Netbooks’ is the name awarded to the recent small laptops that are popping up everywhere. I was going to order mine on Amazon, but learnt that Best Buy (fake one) was selling it in Hawally. I thought I’d check it out and after roaming around for a while I found a shop (a few shops before Best Buy) that gave me a pretty good deal at K.D.140 which is quite competitive to what I’d have paid to Amazon. I got a black EEE 900 and this is the 20GB Linux version. The Linux based OS it comes with is decent but doesn’t give me sufficient flexibility. I formatted it and installed Windows XP instead. FYI, they also sell one preloaded with Windows XP for about the same price, but that has a 12 GB HD, so why lose out on extra space? It also comes with a very nice pouch to keep it cozy. We’ve been using it for a month now (mostly her though) and its an amazing little device. The first thing you notice is how small it is. At 225 x 165 x 35mm (WxDxH), I can place two of these back to back to have a footprint the same size as my 14.1″ HP laptop. The 8.9″ screen is pretty sharp and can go up to a decent 1024×600 resolution. The 1 GB RAM keeps things moving at a decent pace. The 1.3MP built-in camera performs really well with the IMs and the wireless network works like a charm. 20 GB of solid state space is sufficient and efficient for its purpose. What’s more; the touchpad supports multi-touch and gives you some pretty cool ways to scroll (using two fingers) and zoom in/out of pics by pinching. The battery life is decent and it gives around 2+ hours of usage. Weirdly enough, the speakers are placed beneath the body, though I find this aesthetically more pleasing than on the sides like in the 700 series models. The only downside so far is that typing isn’t as convenient as on a standard laptop. The keys are small and it takes some time to get used to it. Overall, I’d say this is a very impressive machine yet it serves a specific purpose. If you are looking for a power-horse, this is not it. If you are looking for something ultra-portable, light, that lets you do basic stuff and even watch movies and listen to music; you can’t go wrong with this Asus. if it runs starcraft (which it should), i am sold! 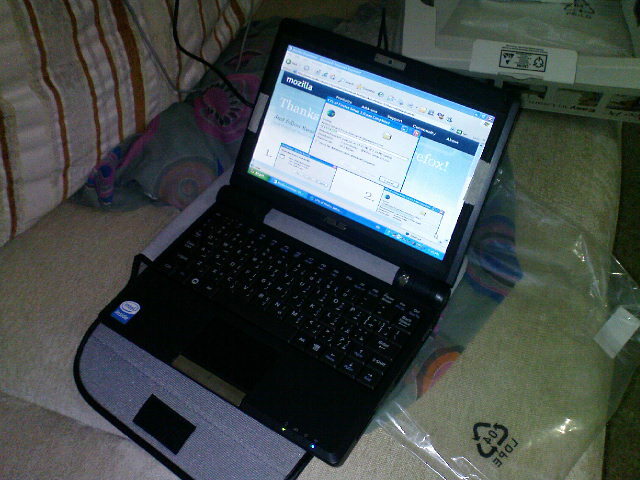 I’ve just bought acer aspire one, check it out. Bought it from best buy (Hawally) at 149KD. The processor is 1.6 Atom, Other than this the features are very close with the asus. That’s pretty cool. Though it seems to be have a smaller HD but has more USB ports. umair: I guess it would probably run SC, though I wonder how playable it would be on an 8.9″ screen. Nice, I have the ASUS u6 series. Pretty good computers 🙂 I’m satisfied!